Q1. In a factory men, women and children were employed in the ratio 8 : 5 : 1 to finish a job and their individual wages were in the ratio 5 : 2 : 3 respectively. Total daily wages of factory amounts to Rs. 318. Find the total daily wages paid to each category. Q3. In a village, each of the 60% of families has a cow; each of the 30% of families has a buffalo and each of the 15% of families has both a cow and a buffalo. In all there are 96 families in the village. How many families do not have a cow or a buffalo? Q4. A businessman imported Laptop, worth Rs. 210000, Mobile phones worth Rs. 100000 and Television sets worth Rs. 150000. He had to pay 10% duty on Laptops, 8% on phones and 5% on Television sets as special case. How much total duty (in rupees) he had to pay on all items as per above details? Q5. The marked price of an article is Rs. 5000 but due to festive offer a certain percentage of discount is declared. Mr. X availed this opportunity and bought the article at reduced price. He then sold it at Rs. 5000 and thereby made a profit of 11 (1/9)% The percentage of discount allowed was? Directions (6-10): What will come in place of ‘?’ in the following questions. Directions (11-15): The following table shows the no. of women from different cities of Bihar who raised their voice to ban on alcohol in Bihar. 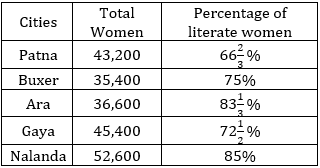 Also, the table shows percentage of women who are literate in them. Study the table carefully to answer the following questions. Q11. What is the total no. of illiterate women from Patna, Ara and Gaya together who raised their voice to ban alcohol in Bihar? Q12. The total no. of literate women from Buxer are what percent less than the total no. of literate women from Ara who raised their voice against alcohol in Bihar (approximately)? Q13. What is the average no. of illiterate women who raised their voice against alcohol in Bihar from all the five cities together? Q14. If 33 ⅓% literate women from Buxer are of age group of (20-30) and 20% literate women of Gaya are age group of (40-50) then find the total no. of literate women from Buxer having age of (20-30) years and total no. of literate women from Gaya having age group of (40-50) years together. Q15. What is the ratio of no. of illiterate women from Ara to the no. of illiterate women from Buxer? Q18. Sita, Gita and Rita three friends start a beauty parlour by investing in the ratio of 3 : 5 : 4 respectively. Sita gets 13⅓% of total profit as her salary for running the business and the remaining profit is divided among them according to their investment ratio. If Sita invests for 12 months, Gita for 8 months and Rita for 6 months and total profit is Rs. 7500 then find the profit share of Gita. Q19. Mr. Raghav owned a flat for Rs. 13.2 lacs. He spends 20% of his monthly salary on its paintings. 25% on lighting and furniture, 15% on foods and other supplements. If Mr. Raghav’s annual salary is 10.8 lacs then find the total spending made by Mr. Raghav. Q31. Total no. of male employee working in support team and marketing department together is what percent of that of female employee working in same departments together? Q32. What is the total no. of male employee working in IT, HR and marketing departments together? Q33. Total no. of male employee working in packaging and IT department together is how much percent more than that of female employee working in the same departments together? Q34. What is the average no. of total employees working in management, support team and IT department together? Q35. Find the ratio of male to female employee working in packaging and HR department together?